A pest is an organism, usually an insect, which has characteristics that are regarded by humans as injurious or unwanted. This is often because it causes damage to agriculture through feeding on crops or parasitising livestock, such as codling moth on apples, or boll weevil on cotton. An animal can also be a pest when it causes damage to a wild ecosystem or carries germs within human habitats. Centipedes (from Latin prefix centi-, "hundred", and Latin pes, pedis, "foot") are arthropods belonging to the class Chilopoda and the Subphylum Myriapoda. They are elongated metameric animals with one pair of legs per body segment. Despite the name, centipedes can have a varying number of legs from under 20 to over 300. All centipedes (discounting individual mutants) always have an odd number of pairs of legs, e.g. 15 or 17 pairs of legs (30 or 34 legs) but never 16 pairs (32 legs). A key trait uniting this group is a pair of venom claws or forcipules formed from a modified first appendage. This also means that centipedes are an exclusively predatory taxon, which is uncommon. Some species of centipede can be hazardous to humans because of their bite. Although a bite to an adult human is usually only very painful, it can be dangerous to small children and those with allergies to bee stings. The bite of larger centipedes can induce anaphylactic shock in such people. Smaller centipedes usually do not puncture human skin. Crickets are harmless to humans. While they are known to carry a large number of diseases, some of which can cause painful sores, they are not fatal to humans. Disease can be spread through their feces, bite, or physical contact, though crickets are not aggressive toward humans and rarely attack. Crickets are a favorite insect of children to collect in areas of the world they populate. Only the male crickets chirp. A large vein running along the bottom of each wing has "teeth," much like a comb does. The chirping sound is created by running the top of one wing along the teeth at the bottom of the other wing. As he does this, the cricket also holds the wings up and open, so that the wing membranes can act as acoustical sails. It is a popular myth that the cricket chirps by rubbing its legs together. 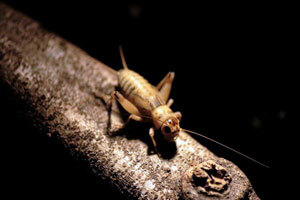 There are four types of cricket song: The calling song attracts females and repels other males, and is fairly loud. The courting song is used when a female cricket is near, and is a very quiet song. An aggressive song is triggered by chemoreceptors on the antennae that detect the near presence of another male cricket and a copulatory song is produced for a brief period after successful deposition of sperm on the female's eggs. Crickets chirp at different rates depending on their species and the temperature of their environment. Most species chirp at higher rates the higher the temperature is (approximately 62 chirps a minute at 13°C in one common species; each species has its own rate). The relationship between temperature and the rate of chirping is known as Dolbear's Law. Using this law it is possible to calculate the temperature in Fahrenheit by adding 40 to the number of chirps produced in 14 seconds by the snowy tree cricket common in the United States. Millipedes are arthropods that have two pairs of legs per segment (except for the first segment behind the head which does not have any appendages at all, and the next few which only have one pair of legs). Each segment that has two pairs of legs is a result of two single segments fused together as one. Most millipedes have very elongated cylindrical bodies, although some are flattened dorso-ventrally, while pill millipedes are shorter and can roll into a ball, like a pill bug. The name "millipede" is a compound word formed from the Latin roots milli (thousand) and ped (foot). Despite their name, millipedes do not have 1,000 legs, although the rare species Illacme plenipes has up to 750. Common species have between 36 and 400 legs. The class contains around 10,000 species in 13 orders and 115 families. The giant African millipede (Archispirostreptus gigas), known as shongololos, is the largest species of millipede. Springtails (Collembola) form the largest of the three lineages of modern hexapods that are no longer considered insects (the other two are the Protura and Diplura). The three orders are sometimes grouped together in a class called Entognatha because they have internal mouthparts, but they do not appear to be more closely related to one another than to insects, which have external mouthparts. 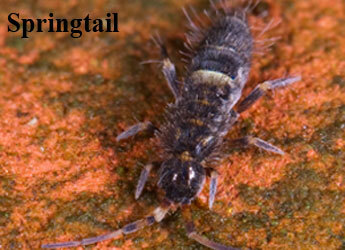 Various sources and publications have suggested that some springtails may parasitize humans, but this is entirely inconsistent with their biology, and no such phenomenon has ever been scientifically confirmed, though it has been documented that the scales or hairs from collembolans can cause irritation when rubbed onto the skin. They can sometimes be abundant indoors in damp places such as bathrooms and basements, and under such circumstances may be found on one's person, but this is only accidental. Claims of persistent human skin infection by springtails may indicate a neurological problem, or else delusory parasitosis, a psychological rather than entomological problem. Researchers themselves may be subject to psychological phenomena. For example, a publication in 2004 claiming that springtails had been found in skin samples was later determined to be a case of pareidolia; that is, no springtail specimens were actually recovered, but the researchers had digitally enhanced photos of sample debris to create images resembling small arthropod heads, which they then claimed to be springtail remnants. However, Hopkin reports one instance of an entomologist aspirating an Isotoma species and in the process accidentally inhaling some of their eggs, which hatched in his nasal cavity and made him quite ill until they were flushed out. A woodlouse (known by many common names: see below; plural woodlice) is a crustacean with a rigid, segmented, long exoskeleton and fourteen jointed limbs. Woodlice form the suborder Oniscidea within the order Isopoda, with over 3,000 known species. Woodlice in the genus Armadillidium can roll up into an almost perfect sphere as a defensive mechanism, hence some of the common names such as pill bug or roly-poly. Most woodlice, however, cannot do this. Pill bugs (woodlice of the family Armadillidiidae) can be confused with pill millipedes. Although they are distantly related to one another, the two are taxonomically distinct. Both of these groups of terrestrial segmented arthropods are about the same size. They live in very similar habitats, and they can both roll up into a ball. Both pill millipedes and pill bugs appear superficially similar to the naked eye. This is an example of convergent evolution. Pill Millipedes can be distinguished from Woodlice on the basis of having two pairs of legs per body segment instead of one pair like all isopods. 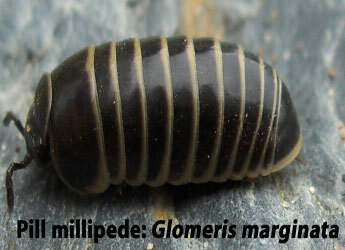 Pill Millipedes also have thirteen body segments, whereas the woodlouse has eleven. In addition, Pill Millipedes are smoother, and resemble normal millipedes in overall coloring and the shape of the segments.